Soil Solutions® provides the most effective Dust Control Solutions. Dust is the fine material consisting of tiny particles of earth or waste matter lying on the ground or on surface areas or carried in the air. Soil Solutions provides proven and effective dust control solutions across many different applications that are smarter – safer – and cost effective – we don’t just say it guarantee it. By Controlling Dust – We provide a Healthier and Safer environment . EBS™ is applied as a Surface Seal to areas that require dust control. Different Application rates are used depending upon the type of area and required duration of performance. The high grade of EBS allows it to deliver long term performance and substantial cost reductions. ONE application provides long term Dust Control which delivers a cost effective and a environmentally sustainable solution. Dust Control at active points is perhaps the most challenging to provide. Crushing and Screening Plants, Blasting Areas, Active Stockpiles, Transfer points and conveyor belts all emit dangerous airborne dust particles. 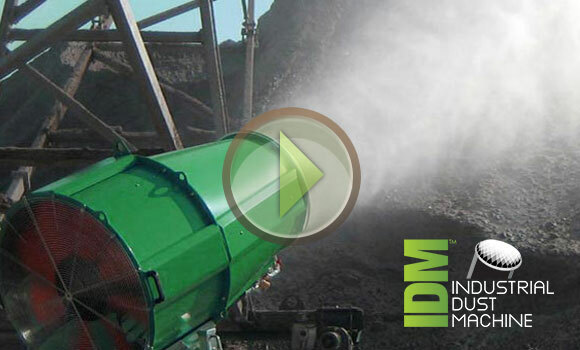 The mobile IDM Industrial Dust Machine is the most advanced and powerful force against dust emissions and airborne dust fallout generated by rock crushing, screening, conveyor and transfer points by delivering a matchless ability to manage and mitigate dust fallout which can be attributed to its standalone technology.